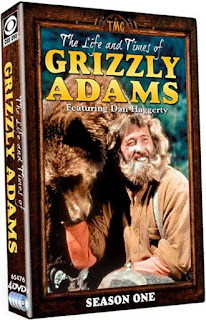 Well, this was one TV show from the 1970s I truly never expected to make it to DVD: Grizzly Adams (officially "The Life and Times of Grizzly Adams") which starred Dan Haggerty in that lead role. My recollections of this show were of an older man with greyish hair and a bushy beard who fled life in the city of Denver to live in the mountains of Colorado without any electricity, phone, packaged food or any other modern conveniences. Now, I was an eight-year-old kid at the time, but I recall this strange man befriending a huge Grizzly Bear he named Ben (after Benjamin Frankin), hence his character name was referred to as John "Grizzly" Adams. I also recall the guy who would later star as Uncle Jessie on "The Dukes of Hazzard" (portrayed by actor Denver Pyle) playing a role as another woodsman in (on?) this show, which aired for two seasons on NBC television starting in 1977. However, I should note that my recollections are actually a bit vague because this show was never really re-run ad nauseum the way many other programs of the same era have been (which solidifies the shows in our memories), but the lead character was, in fact, a convicted criminal, although he proclaimed he was convicted of a crime he did not commit. Still, the fact that anyone could truly exist and live off the land in the Rocky Mountains meant this show had a loyal following among environmentalists. 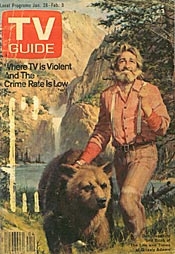 While the show was supposedly set in the Colorado Rockies, a very exhaustive and comprehensive website called GrizzlyAdams.net indicates that most of the scenery was, in fact, filmed in the Rocky Mountains of Utah, although much of the filming actually took place in a Los Angeles area TV studio. Regardless, there's news (see HERE) from TV Guide's TVShowsonDVD.com that the folks at Shout! Factory will release Season 1 (there were only 2 seasons) of "The Life and Times of Grizzly Adams" on DVD, hence the first season of this peculiar show will be digitized and available to future audiences at the push of a button. The scheduled release date is November 6, 2012. The aforementioned website (GrizzlyAdams.net) has almost anything one could possibly want to know about this particular retro TV show, including a comprehensive episode guide, so if you want to have a look at what exactly will be included on the Season 1 DVD release this is a good place to do it. Along with the DVD release, presumably, Amazon.com will also enable live streaming as they do for many other digitized TV shows, so you may be able to watch it on your iPad, Roku player or even with the luxury of a 2-inch screen on your mobile phone! I'm interested mainly for the nostalgia-value this release may provide, but as with any DVD release, sales of Season 1 is likely to determine whether the second season will ever be released or even digitized. 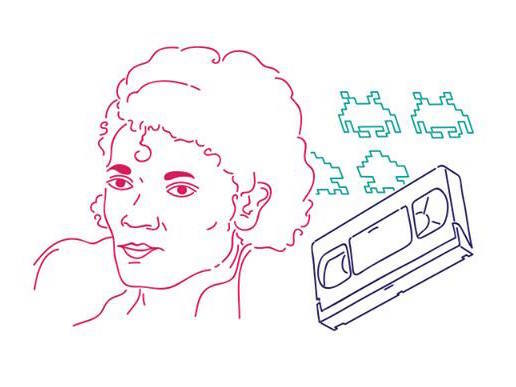 Amazon.com shows pre-order pricing which is actually better than the "official" release price at just $20.95, so it's priced low enough to make an attractive holiday gift for any aging hippies or environmentalists with a penchant for retro television!